Godzilla: The Planet Eater advertised at the Shinjuku Wald 9. Photo by Brett Homenick. As unexpected as it may seem, Godzilla: The Planet Eater, opening in Japan on November 9, is essentially nowhere to be found at the Toho Cinemas Shinjuku. I mean, if the film is being advertised anywhere in Japan, it would have to be there, right? Wrong! When I walked into Shinjuku Wald 9 (a movie theater a fairly short distance away from Toho Cinemas), I was quite surprised to see this wall-size advertisement for the film right as you enter the theater. 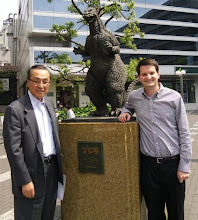 Perhaps the theater's close proximity to the Godzilla Store has something to do with it. Anyway, it was a nice (but completely accidental) find. Typhoons Won't Stop the Drama! Shoji Mori (left) and Masanori Machida share a laugh as they wrap up the evening's event. Photo by Brett Homenick. As a typhoon approched Tokyo, I attended another dramatic reading with actors Masanori Machida and Shoji Mori. By the time I arrived, it wasn't even raining, but as I type this, the wind and the rain are in full force. 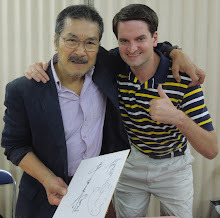 After the event wrapped, I asked Mori-san to sign my DVD sleeve of Zatoichi and the One-Armed Swordsman (1971), in which he appears. Mori-san was surprised and commented on how nostalgic it was for him to see it. KAMEN RIDER X REUNION! 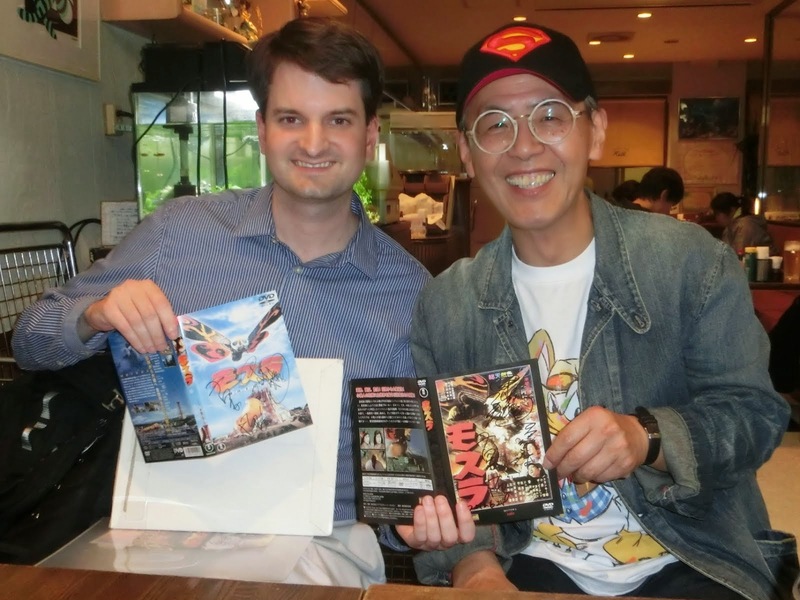 Forty-Four Years Later, Two Toei Heroes Ride Again! 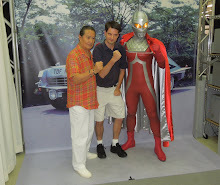 Suit actor Kazuo Niibori (left) and actor Ryo Hayami strike the famed Kamen Rider pose. Photo by Brett Homenick. Today, I attended a special Showa Hero event in Nakano, Tokyo, in which two veterans of the Kamen Rider series reunited and hosted a Q&A session, as well as signed autographs. 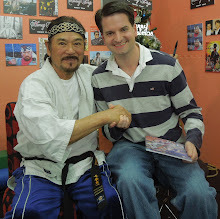 Kazuo Niibori is a veteran Kamen Rider and Super Sentai suit actor. He started with both franchises from the very beginning, suit-acting as Kamen Rider 1 and Kamen Rider 2 in the original Kamen Rider (1971-73), as well as Akaranger in Himitsu Sentai Goranger (1975-77). In fact, Niibori-san would go on to don the red suit in the Super Sentai series all the way up through Chojin Sentai Jetman (1991-92). Likewise, he played multiple Kamen Riders early in the series' history, which includes stints as Kamen Rider 1 in Kamen Rider V3 (1973-74), Kamen Rider X in Kamen Rider X (1974), Kamen Rider Amazon in Kamen Rider Amazon (1974-75), Kamen Rider Stronger in Kamen Rider Stronger (1975), Sky Rider in Sky Rider (1979-80), and Kamen Rider Black RX in Kamen Rider Black RX (1988-89). Along the way, he played the titular hero in Daitetsujin 17 (1977) and even guested on episode 10 of the Toho superhero series Megaloman (1979). (He appears as an out-of-the-suit baddie in that one.) He also played one of Ulrov's henchmen in the feature film Espy (1974). Actor Ryo Hayami. Photo by Brett Homenick. Also in attendance was actor Ryo Hayami. Hayami-san joined Daiei Studios in 1969. Under the stage name Sanshiro Honoo, he portrayed Keisuke Sawada (one of the main characters) in Gamera vs. Jiger (1970). He is much better known these days, however, for starring as Keisuke Jin in Kamen Rider X, which of course was the theme of the day. The event started off with a fun (but brief) stage show in which Niibori-san did battle with with an event staff member. It was a lot of fun to see one of Toei's most celebrated suit actors do what he does best. Both guests were quite friendly and enjoyed themselves immensely. Despite not being very familiar with Kamen Rider, I enjoyed this foray into the world of Kamen Rider X. Today, I attended a screening of a 35mm print of Masahisa Sunohara's Kaminari Otemba Musume (1961), produced by Nikkatsu Studios. The film is a lighthearted comedy about a young tomboy who rides a motorcycle and ultimately falls in love with another motorcyclist. Also at the screening was Nikkatsu actress Mayumi Shimizu. Joining Nikkatsu in 1957, Shimizu-san starred in a bevy of films for the studio. She eventually married fellow Nikkatsu actor Yuji Odaka (of Gappa the Triphibian Monster fame) and is the aunt of Godzilla series actress Megumi Odaka. She even has her own tokusatsu connection, guest-starring in episode 38 of Ultraman 80 (1980-81). When I presented her with a photo of our first meeting in February for her to sign, she pointed to me in the photo and said in English, "Handsome." Well, I'll let Shimizu-san have the final word on that. Naturally, it was great to see her again, and the movie was a lot of fun, too. Let's do it again! Wakako Tanabe Q&A at Vantage Point Interviews! Actress Wakako Tanabe. Photo by Brett Homenick. My interview with Toho actress Wakako Tanabe is now live at Vantage Point Interviews. 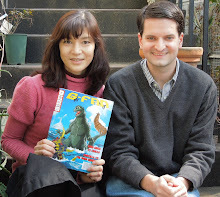 She was Gaira's Haneda Airport victim in War of the Gargantuas (1966), but if you'd like to find out more about her career, check out the interview right now! CINEMA TOWN CHOFU! Gamera and Daimajin Stomped Here! Cinema Town Chofu. Photo by Brett Homenick. Today, I paid a visit to Chofu, Tokyo, which has certainly embraced its cinematic roots in recent months. Chofu is the home of Kadokawa Daiei Studios as well as Nikkatsu Studios, but its Daiei and its rich tokusatsu history that takes center stage at Chofu Station. Let's take a look. P-LABO FILMFES 2018! The Annual Indie Film Festival Returns! Actress Kaname Wakaba. Photo by Brett Homenick. Monday, September 24, was a national holiday in Japan, but not for me. Unlike most lucky office employees in the country, I had to go to work. This also was the day that Wataru Mimura's annual P-LABO FILMFES was held in Chofu. Thankfully, due to a change in my work schedule, I managed to squeeze in a visit for just over an hour. I'm glad I did. The event was MCed by actress Kaname Wakaba, whose sole tokusatsu outing was episode 10 of Ultra Q: Dark Fantasy (2004). She has occasionally MCed P-LABO FILMFES in the past, and it was the first time I'd seen her in a while. I was able to take in a few of the indie flicks screened the festival. The ones I saw were very short (not more than just a few minutes), and all were shot on video. Quite a few were humorous, but there were a few that were more horror-oriented. They were fairly enjoyable for what they were. Toward the end, I visited Mimura-san in the green room. I hadn't seen him in a few months, so we did a bit of catching up. I wish I could have stayed longer, but some folks have to work for a living. There's always next year! In between scriptwriter Masaki Tsuji and anime voice actress Fuyumi Shiraishi. After attending the Nobuo Nakagawa event, I immediately joined another one, this one attended by scriptwriter Masaki Tsuji and anime voice actress Fuyumi Shiraishi. 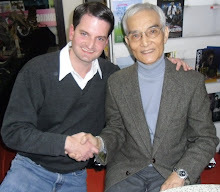 I was particularly interested in meeting Tsuji-san, as he wrote episodes for Captain Ultra (1967), Spectreman (1971-72), and Dinosaur Corps Koseidon (1978-79). Shiraishi-san, despite being best known for her anime work, has a couple of tokusatsu credits herself, as she voice-acted in episode 40 of Ultraman Leo (1974-75) and episode 17 of Super Robot Red Baron (1973-74). It was a fun (albeit brief) evening. 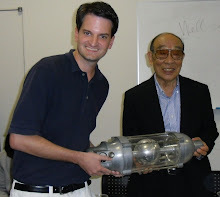 NOBUO NAKAGAWA CELEBRATED! Attending a Special Event Honoring the Legendary Director! Composer Chumei Watanabe answers questions during a Q&A. Photo by Brett Homenick. On Sunday, September 23, I had the honor of attending a special event in Tokyo celebrating the career of director Nobuo Nakagawa. It was my first time to attend such an event, but I was really surprised at how impressive it was. There were quite a few luminaries on hand for the festivities -- much more than I expected. Shinkichi Nakagawa, the son of director Nakagawa. Photo by Brett Homenick. The event kicked off with a screening of Nakagawa's Ningyo Sashichi torimonocho: Oedo Ushimitsudoki (1957), which was scored by the event's guest of honor: 93-year-old composer Chumei Watanabe. I missed the film screening but arrived just in time for Watanabe-sensei's Q&A following the event. 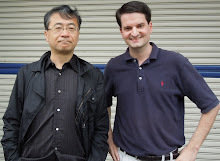 I was amazed when Watanabe-sensei mentioned my interview with him last July at the end of his interview session, during which he also discussed the interest his work has among many fans internationally. He's proud of the international following his work enjoys -- and rightfully so. Actress Sumiko Abe. Photo by Brett Homenick. After Watanabe-sensei's interview, the group gathered in a nearby restaurant that had been reserved specifically for the event. 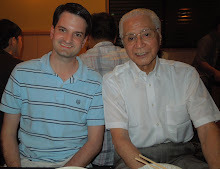 The gathering was a veritable "who's who" of friends, family, and colleagues of director Nakagawa. I was quite surprised at just who was in attendance. 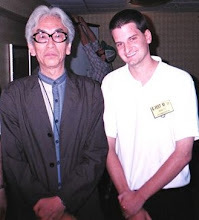 The first person I was introduced to was the director's son, Shinkichi. I certainly wasn't expecting to meet him at the event! We exchanged greetings as well as business cards. Director Masahisa Sakashita. Photo by Brett Homenick. Also on hand was actress Sumiko Abe, whose credits are very impressive. She had just turned 88 years old on September 3, but you wouldn't have guessed it had you not already known. She was incredibly spry and in great spirits. Among her credits are: Toho's Love in a Teacup (1953), starring Toshiro Mifune and directed by Yasuki Chiba, Shintoho's The Depths (1957), directed by Nobuo Nakagawa, and Shochiku's Flag in the Mist (1965), directed by Yoji Yamada. Akihide Tsuzawa. Photo by Brett Homenick. 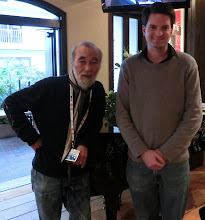 I also met Nikkatsu Studios veteran Masahisa Sakashita. While he worked his way up through Nikkatsu Studios during the 1970s, more recently he has worked as a freelance television director. 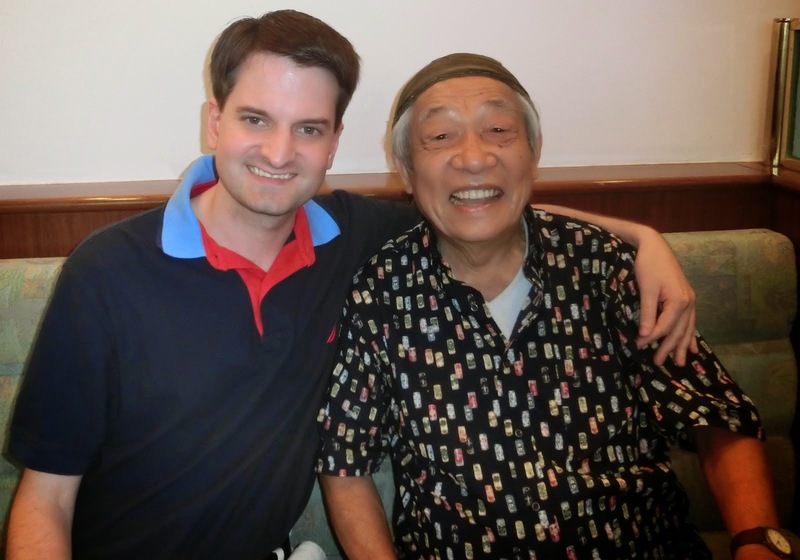 I also had a fun chat with actor Akihide Tsuzawa, best known for playing Hoshino on the original Ultraman (1966-67) TV series. 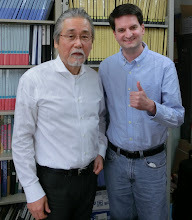 I was pleased to find that Tsuzawa-san remembered me from our first meeting two years prior. 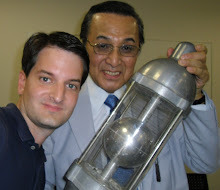 He also called me cool, which coming from a veteran of the original Ultraman is quite a compliment. Suffice it to say, I met a lot more folks than I had ever anticipated. 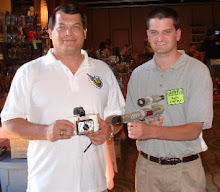 Toward the end of the event, while the MC was handing the microphone to the various special guests on hand, he offered me the microphone. I had no idea what to say, but I did my best to muster something. After saying a few things, I noticed Watanabe-sensei walking in my direction, so I handed him the mike. I was very thankful for his well timed assist! What an afternoon! I elected to miss the latest Super Festival in order to attend, and I'm very glad I did. The more recent Super Festivals have been pretty lackluster (in my opinion, of course), but this event was anything but. One for the history books, for sure! MATANGO! Viewing the Toho Classic in 35mm! Akira Kubo. Photo by Brett Homenick. Today I was lucky enough to take in a 35mm screening of the Toho classic Matango along with Toho star Akira Kubo. Matango, of course, is one of Toho's most effective horror films, and it was quite fun to be able to look over at Kubo-san's reactions during some of the key scenes. 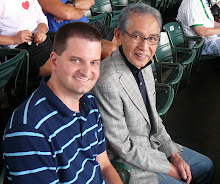 I hadn't seen Kubo-san in close to three years, and not only did he remember me, it was wonderful to see him doing so well. All in all, it was quite a day! DOWNRANGE! Attending the Japanese Premiere of Ryuhei Kitamura's Independent Thriller! Poster art for Ryuhei Kitamura's Downrange. Photo by Brett Homenick. On September 6, I was fortunate enough to be invited to attend the premiere of the Ryuhei Kitamura's latest film, Downrange (2017). Shot in California on a low budget, Downrange is about a sniper who takes out an SUV full of college students and young adults in the middle of nowhere and tries to pick them off one-by-one. The premise is very simple, but the results of it are anything but. Director Ryuhei Kitamura discusses the film following the premiere. Photo by Brett Homenick. The premiere took place at Tokyo Culture Culture in Shibuya. It was an exciting event filled with press and luminaries from the Japanese entertainment world. Naturally, the main attraction was the screening of Downrange, which certainly thrilled and chilled the audience with whom I saw it. Make no mistake, this is an extremely graphic film, and it is not for the squeamish. In fact, part of the fun was simply looking around at the audience during some of the more gruesome sequences. The young women in attendance had some amusing reactions to all the gore. 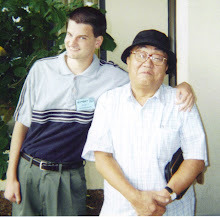 Ryuhei Kitamura. Photo by Brett Homenick. It's a brutal and downbeat film that succeeds when it keeps things minimal. Some of the sequences reminded me of No Country for Old Men, which is high praise, indeed. The film didn't work as well for me when it injected style and flashy camera angles into the proceedings. It just takes me out of the picture, and I prefer to immerse myself in the film-going experience, especially in a realistic horror film like this. Despite that criticism, I enjoyed Downrange. It delivers genuine shocks and thrills in a time when most horror movies just induce yawns. While most flicks I've seen over the summer have been forgettable, many of the visuals in Downrange are hard to forget. This one sticks with you. 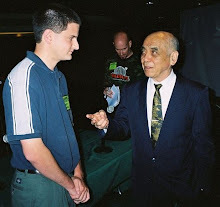 In 2004, I attended the world premiere of Godzilla: Final Wars in Hollywood. 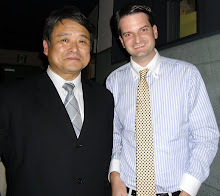 I never expected to attend another premiere of a Ryuhei Kitamura movie, but I'm very glad to have had the opportunity. If you like horror movies, and if the current crop the studios are churning out doesn't do it for you, check out Downrange. It's refreshing to see some effective, stripped-down horror in a sea of cheesy jump scares and CG ghosts. TOEI VILLAIN! Attending a Special Event with Shinzo Hotta! Shinzo Hotta. Photo by Brett Homenick. The second event I attended today also had a Toei theme. It was headlined by Shinzo Hotta. Hotta-san's acting roles date back to the mid-1960s at Toei Studios. Among many others, his credits include: Female Convict Scorpion: Jailhouse 41 (1972), Iron King (1972-73), Ninja Captor (1976-77), and Message from Space: Galactic Wars (1978-79). 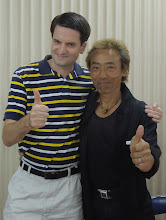 I first met Hotta-san three years ago, and haven't had a chance to see him since then. 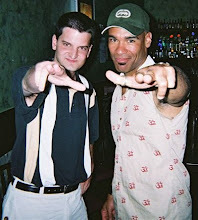 Of course, he was very friendly and approachable, which is exactly how he was when I first met him. TOEI HEROES CONVERGE! Two Superhero Actors Join Forces for an Event in Shinjuku! 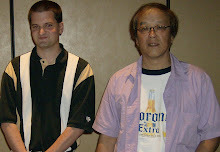 Sayoko Hagiwara and Takumi Tsutsui. Photo by Brett Homenick. 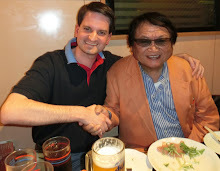 Today, I attended a special event in Shinjuku that was guested by two popular actors from '80s Toei superhero programs. The first guest was Takumi Tsutsui, who starred in Sekai Ninja Sen Jiraiya (1988-89), which is a show with an intenational following. The other guest was Sayoko Hagiwara, who played the role of Ryoko Hoshi, Yullian's human form, on Ultraman 80 (1980-81) from episode 43, as well as Dyna Pink on Kagaku Sentai Dynaman (1983-84). She also appeared on Choushinsei Flashman (1986-87) as the villainous Leh Nafel. I've blogged about her many times in the past. 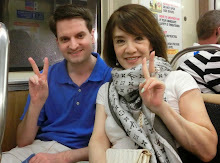 It had been a few months since I last saw Hagiwara-san, so I especially enjoyed seeing her again. We had a nice chat, and when I left the event as things were winding down, she walked me to the door and kept chatting. It's not every day you get that kind of treatment from special guests!